Oracle Cloud Applications Release 13 – its bi-annual cloud applications release – announced last week solidifies the company’s position as the industry’s broadest suite – across ERP, HCM, CRM and SCM domains. Oracle has been at work on this for over a decade now, and it shows that competitors like SAP and Infor who want to sell broad suites still have a few more years of work before their next-gen products reach the same level of breadth and maturity. While all their products have been evolving, the adoption in their customer bases has been gradual. The cloud/in-memory penetration in on-premise customers across Oracle, SAP, Infor, Unit4 and even the pure play cloud vendors like Salesforce and Workday is still, by my estimate, less than 20%. Can release 13 prove to be the pivot point to accelerate customer adoption not just for Oracle but for the broader enterprise applications market? a) stable on-prem functionality – many customers will cite stability of their on-premise software as reason not to move to the cloud. The last generation of software applications are mature and “safe” and they can manage their costs with third party maintenance and other techniques. In contrast, migration to next-gen applications opens them to change management risks and another wave of SI costs and potential failures. It’s changing – I know several CIOs who are adopting a “cloud first” mindset but there many more who worry about the fear of the unknown. b) new choices have emerged – I hear from a segment of customers that over the last decade, they have seen consumer tech, and peer companies like GE push the boundaries of process automation, cloud data centers, industrial internet much faster than have their enterprise software vendors. Also, those embarking on digital transformations say custom developed processes and products using social, mobile, analytical components have exposed them to a new wave of technologies and vendors. In other words, the landscape enterprise vendors compete in has changed quite a bit but they still tend to mostly look at and keep up with each other. c) lack of vertical functionality – very few vendors have moved non-manufacturing functionality to the cloud. Many vendors claim to support “services” industries with their PSA capabilities but that does not help healthcare, retail, banking, utility and so many other industries. Many customers are waiting for cloud suites which provide a broader footprint for their industries. d) distaste for software industry practices – still other customers will say they have been shell-shocked by the behavior of software vendors and their partners in the last few years. They are unwilling to re-commit given that distaste. Now that products are starting to mature, I hope enterprise vendors start focusing on these and other issues which are holding back many customers. 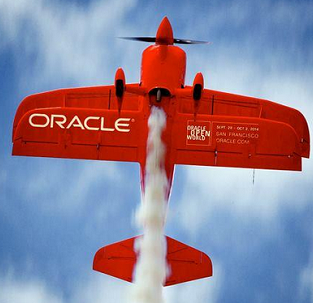 With 13, Oracle has a clear product lead. As it invests in its IaaS data centers, its machine learning and other innovations, it will help the sector’s image in other ways. In many ways, I believe it is poised to be the locomotive for the sector. Time to accelerate!